Most of you know, or have figured out, that I teach, but I’ll give you some insight to Rob and my after work household conversations. I tell stories of cute kids and the funny things they say, and Rob comes home and says, “Well, today I was tested on how close I could get to the top of a tree without hitting it.” Quite a difference in topics, he definitely keeps me on my feet. Rob is a helicopter pilot for the Coast Guard. He is stationed up here on the coast of Oregon for the next few years, and I have to say, his stories of flying through clouds, searching for lost boatsmen, and almost daily getting a free wildlife nature show watching whales breach and sea lions play, understandably trump mine. But with those stories come the reality that my babe will eventually be deployed to some drug-intercepting boat off the coast of the Pacific, and weekly he stands duty awaiting those frantic adrenaline-laced calls of frightened lost or distressed fishermen, leaving me with a quiet little house all to my lonesome. Although I do miss him and given the option, would prefer not sleeping alone, I am not complaining – I knew this was the life of a Coastie pilot. Plus, it’s always worth it when he comes home in his flight uniform… *sigh*). So yesterday was a duty day, and I had the itch. The cooking itch that arrives when you wake up, and doesn’t become satiated until meals and treats are prepared with love and, of course, the freshest of simplistic ingredients. I had promised Rob a salad to take for lunch, so I quickly grilled some sweet corn and zucchini, chopped up some leftover Tri-Tip steak diced some tomatoes and a green pepper, and opened/drained a can of organic black beans. 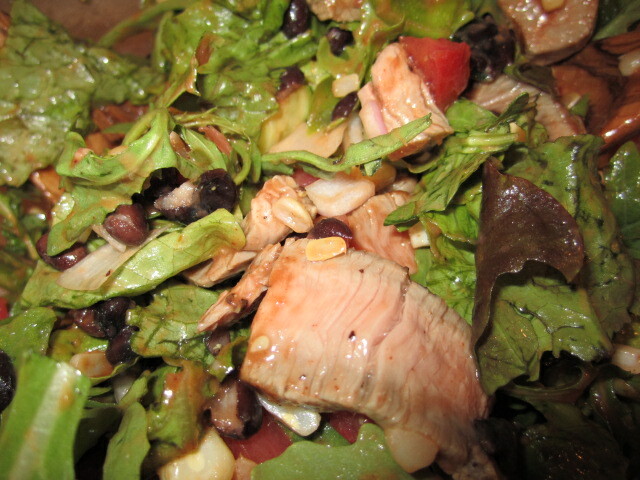 Tossed in a bowl with some baby red lettuce, a bit of arugula, homemade tangy BBQ sauce, squirts of lime juice and s&p, and voila – A gourmet BBQ Tri-Tip Southwestern Salad…. all before 10:00am. I got a call around 2:20: “Hey babe. I landed. Never flown in such bad weather, it was very hard to see. The salad was delicious! I love you!” Hmm. The incongruity of the two statements – not being able to see when flying and enjoying a salad, along with the nonchalant nature of expression – just boggles me. Nevertheless, I was glad he landed safely, and the salad made him happy. Knowing he was safe and and sound, it was on to other things – sweet things, comforting things. Chocolate Cream Pie with Banana Bread crust and Mushroom Pizza with oven-dried tomatoes. Yum. 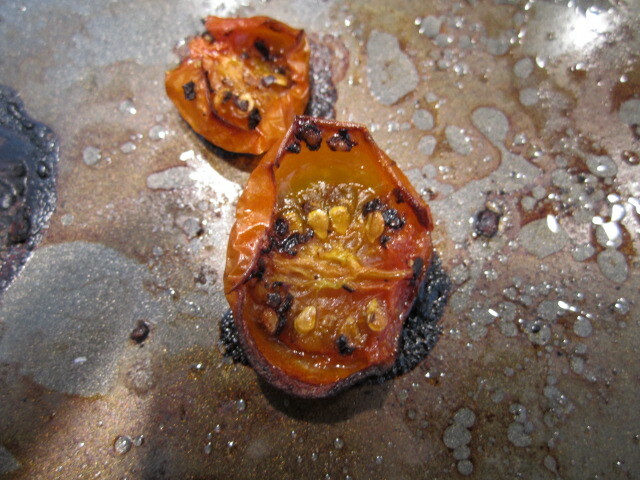 The oven-dried tomatoes are a nod to my new foodie friend, Chef Jardin of the Black Market Gourmet shop. I walked into the store last Friday, wet and cranky from the standard Oregon rain that day, and was immediately hugged by a smell of something sweet, tangy, and warm. Jardin greeted me and I expressed my interest in the aroma, almost forgetting my reason for entering the store (I was looking for Truffle Butter). We got to chatting, he shared his tomatoes (oh so sweet and chewy with the hint of charred caramelization on the edges), we conversed over recipes, and I left, sans truffle butter (I can’t find it anywhere here!). 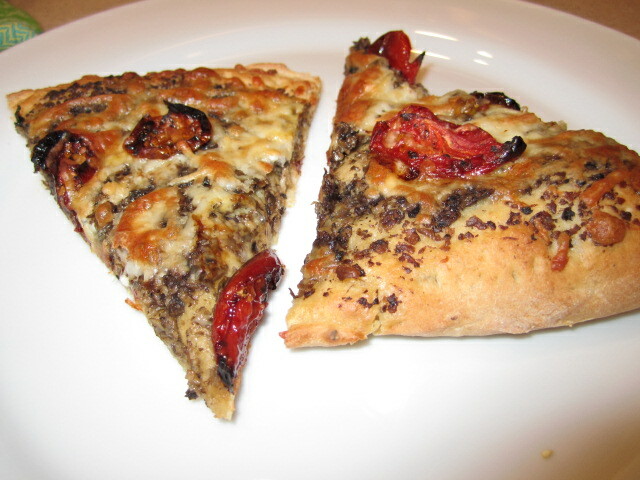 Fast forward back to Sunday, I was thinking about my pizza – a mushroom “pesto” with salty anchovy paste, nutty parm. reg. cheese – what better time for the oven-dried tomatoes to make their subtle appearance? So I cranked up the oven to a blaring 275 degrees, and drizzled olive oil, a bit of s&p, and let them be, wilt, and almost melt for about 2 hours. The house smelled delicious. While the tomatoes were doing their magic, I took to making the Chocolate Cream pie. Oh MY so easy! And so, so, soooo yummy. I called my mom to tell her, it was so good. I dare you to make this and not go for seconds. And thirds. And lick the plate. Then, with Sunday night football on the tele, the best accompaniment had to be pizza – Mushroom pizza. There is something so genuine about smelling foaming yeast, kneading dough, and the anticipation when you lift the towel to see the dough actually DID rise! And then having the earthy mushrooms and salty cheese and sweet tomatoes to boot – YUM again. So please keep reading – and try these out the next time you want to cook to impress…. or just cook for yourself! Preheat the oven to 400 degrees. In a food processor, grind up the banana bread until very fine crumbs. Press the crumbs into the bottom of a spring-form pan, packing tightly. Place in oven for 20 minutes, or until the crumbs have dried out, and set together. In a medium-sized pot, mix the milk, cream, sugar, corn starch, and salt over med-high heat. Stir occasionally for about 1 minute, until mixture starts to get bubbles around the edges from the heat. Turn stove down to med heat, and continually whisk for the next 5 minutes. The mixture will thicken considerably. Add about a tbsp of the milk mixture to the egg yolks, and whisk, and then add another tbsp. This is tempering the eggs so they do not scramble. When mixed, add the eggs to the pot, lower stove to low heat, and continually whisk for the next 2 minutes. The mixture will thicken a bit more, and start to smell like sweet eggs. 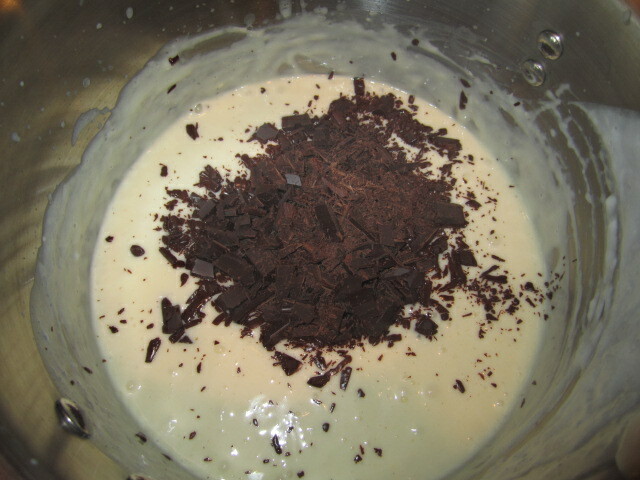 Take pot off the heat, and add the chopped chocolate, continually whisking. Set aside to start to cool. Meanwhile, whisk the rest of the heavy whipping cream into an oblivion with the confectioners sugar and the vanilla extract. 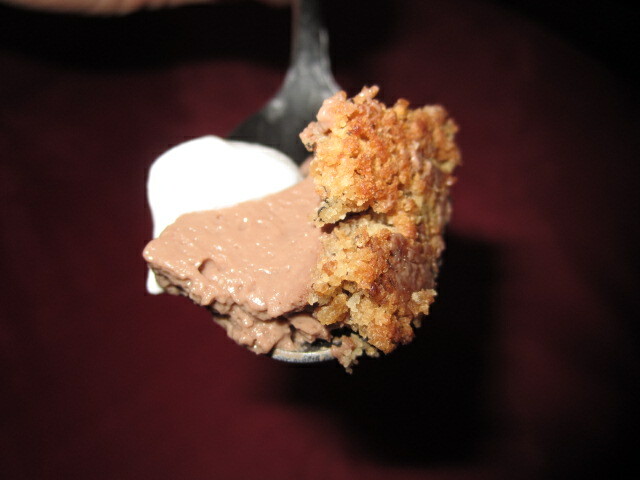 Measure 1/4 of the whipped cream, and, with a spatula, fold the cream into the cooling chocolate mixture. Pour the filling into the spring-form pan and jiggle to even it out. Place a piece of plastic wrap directly onto the surface (so a skin doesn’t form… unless you like the skin, but then you and George Castanza probably have a lot in common), and place in the fridge. 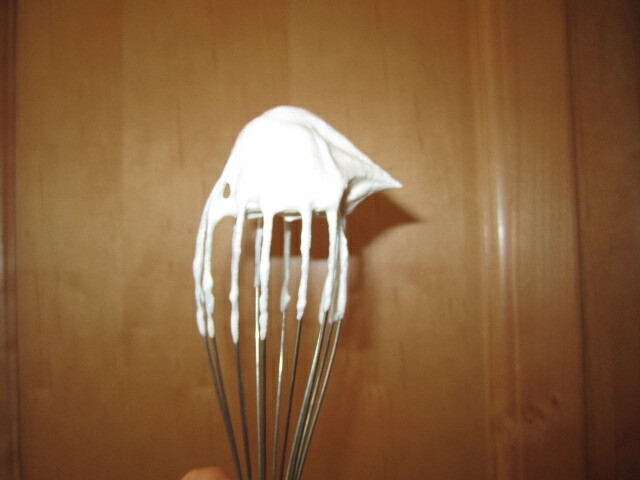 After at least an hour in the fridge, cut, dollop with the extra whipped cream, serve, and ENJOY! In a stand mixer (fitted with a dough hook) or large bowl mix honey into warm water to dissolve, then add yeast. Stir to lightly incorporate, and let sit for about 10 minutes. When ready, yeast should be frothy and smell like sweet beer. Meanwhile, mix dry ingredients, and oil a separate bowl with 1/2 tbsp of the olive oil. To the yeast mixture, add 2 tbsp olive oil and, while mixing, add dry ingredients. Make sure dough is well incorporated (use a spatula to wipe down the sides of the bowl if necessary), and when dough starts to come together in a ball, transfer onto a floured work surface. Knead dough for 6-7 minutes, adding more flour if dough gets too sticky (dough should have a sticky feel, but nt so much that it won’t pull off the kneading surface). When dough is risen, lightly punch down and remove from the bowl. Give a few more kneads for good measure, and divide dough in half. NOTE: If you want to freeze dough, now would be the time to do it. Wrap well in plastic wrap and place in a freezer bag, releasing the air. NOTE AGAIN: If you want an extra-chewy, lighter pizza dough, let rise again for another hour, and repeat twice. 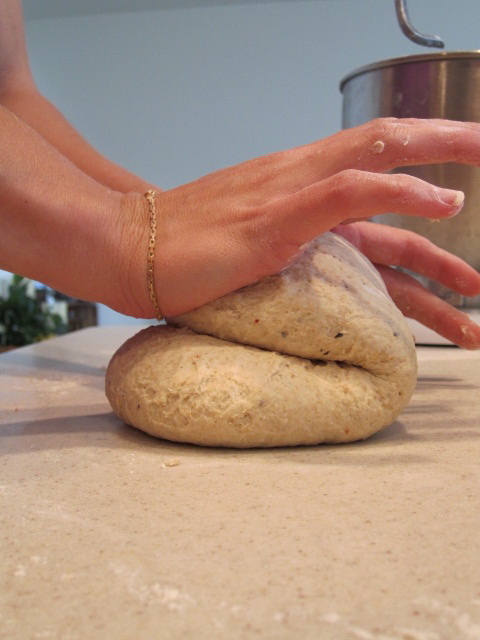 When ready, evenly stretch out dough using your hands or a polling pin. Sprinkle your pizza stone or sheet tray with corn meal, and place pizza dough on top. If you like a thinner crust (I do), poke repeatedly and evenly with a fork. ** I bake most of my pizzas at 425 degrees for about 15-20 minutes, or until outer crust is golden and firm. 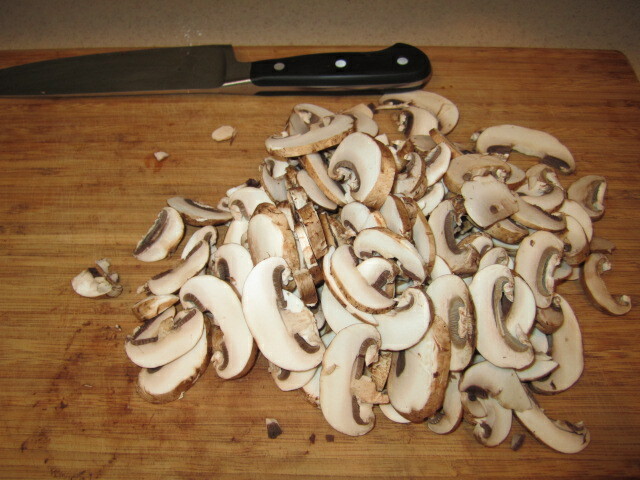 2 cartons Crimini mushrooms, wiped and sliced. 1 c Italian 4-cheese blend (can buy pre-shredded, or mix 1/4 each of: Mozzarella, Asaigio, Fontina, Parmesean Regiano. 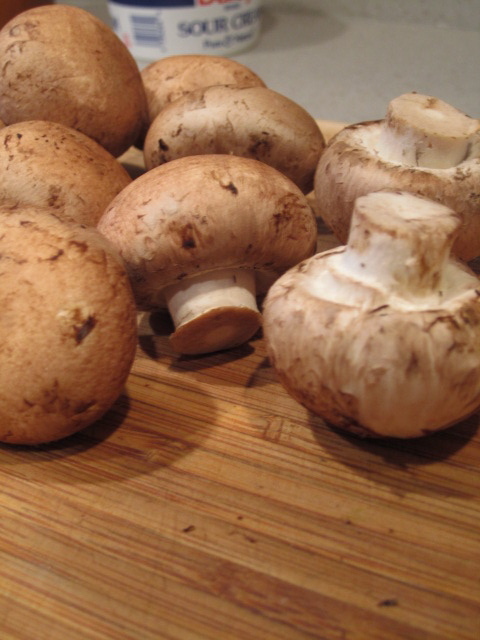 Saute mushrooms in butter, until browned, about 10-15 minutes on med-high heat. Add anchovy paste, thyme leaves, and mix. Deglaze pan with white wine, picking up the brown bits, and reduce until almost no liquid is left. Take off heat, and pour into food processor. Pulse until finely ground – it will look the same consistency as pesto. Spread evenly over prepared pizza dough. Top with a sprinkling of most of the cheese, and oven-dried tomatoes, and then the rest of the cheese. 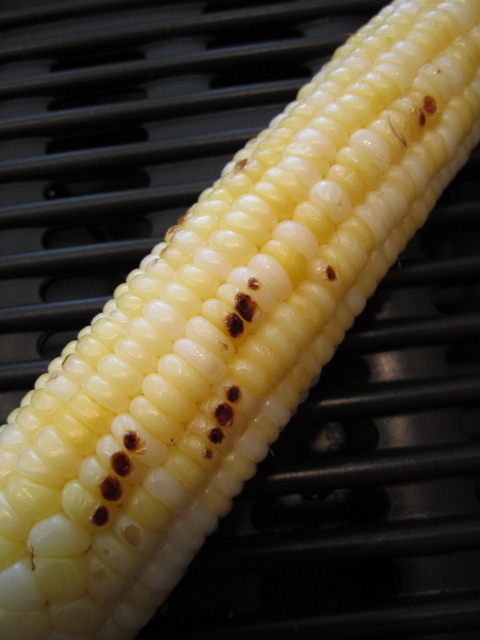 Bake at 425 degrees for 15-20 minutes, or until the outside edges are golden brown and firm to the touch. Serve! Enjoy!! NOTE: This pizza would be fantastic with a drizzle of white truffle oil before baking. I would do it, but anything truffles are non-existent in this town!